Coralville’s new intermodal facility opens on August 24 in the Iowa River Landing. A park-and-ride commuter program, local and regional bus service, secure bike lockers, electric car charging stations, connectivity to trails, and green features support community transportation options. Monthly commuter parking passes and monthly bike locker rentals are on sale now. 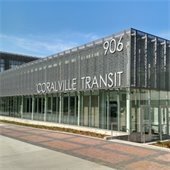 To learn more about the Coralville Transit Intermodal Facility, visit www.coralville.org/intermodal. Check Your Route Before You Bus About! 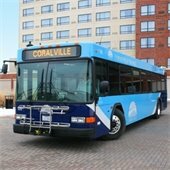 Coralville Transit will launch new bus routes, route adjustments, and schedule changes on Monday, August 24. Service to the Iowa River Landing has been added, and some routes and schedules have changed. View routes and schedules. After an intensive two week musical boot-camp rehearsal, professional singers and eager students bring a full production of Leonard Bernstein's iconic musical in this tragic tale of star-crossed lovers. Join Dorothy, Tip, and the Cowardly Lion on a quest to help Scarecrow regain the throne from the dastardly Nome King. This performance is a world premiere of the stage adaptation written by local playwright Matt Falduto.